Motorcyclists are represented disproportionately in accident statistics because they are not protected by a safety cocoon like a car driver is. Motorbike riders should be wearing the best safety gear possible (read our guide), and the best helmet possible (read our guide), but there’s only so much protection that they afford and a nasty accident can results in significant injuries. In this article we’ll look at the different parts of your body that can be affected, starting from the feet and working our way up to the most important part of your body, your head. Your feet and ankles can become trapped under the bike in a lowside accident, and the bike can run over them. If you are wearing boots then they will be protected, but if you are wearing shoes the heavy motorbike will twist your ankle and it can break it. If you are involved in an accident where you slide along the road, tarmac will wear through anything other than leather or custom motorbike boots very quickly. Proper motorbike boots and shin guards will protect against this. Injuries to the legs can be caused by the legs striking the handlebars, by the bike falling on the legs in a lowside accident, by sliding into a solid object, or by the bike hitting the legs after a highside accident. 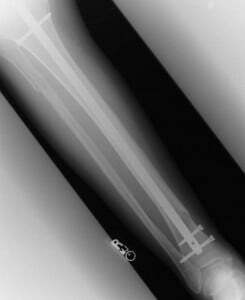 Breaks to the femur are more serious than breaks to the tibia or fibula. Proper motorbike pants will give you added protection as they often come with padding in key places. On a bike the only thing that’s stopping you sliding forward on the seat is the petrol tank, so if the bike stops suddenly your groin will impact on the petrol tank or the instruments. This can cause extreme injuries to the testicles and can crack your pelvis. Falling off the bike in a lowside accident can cause bruising and contusions on the hips. Hitting a solid object at speed can cause general bruising, damage and even death, but taking a handlebar in the stomach can rupture your spleen. 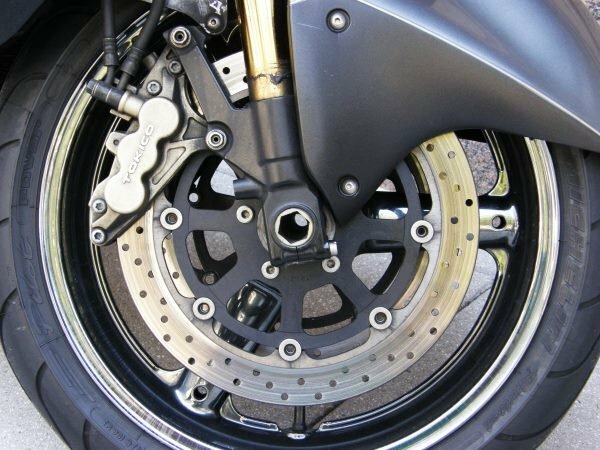 If you are involved in a highside accident (where you are thrown over the bike) the bike can then run into you – imagine a 200kg lump of metal hitting your body at whatever speed you were doing when you came off. A good quality motorbike jacket will help protect your torso. Breaking your back is one of the worst things that can happen in an accident as there’s the risk that it will leave you paralysed. A spine protector is the best option. If you don’t let go of the handlebars in an accident you risk breaking your wrists. Your arms can also be broken if you hit other objects when you fall off. If you land on your shoulder it can break your collarbone and cause nerve damage which leaves a tingling sensation in your arm. There’s not a lot you can do to protect your neck as you need to be able to move your head, therefore the types of devices used in racing cars (HANS, for example) don’t work on a motorbike. You can protect your head, though, by purchasing the best helmet you can afford. Check out the SHARP ratings of helmets before you buy so that you know their strength. If your motorbike is loud and you ride it frequently for long periods of time, wear earplugs because extended exposure to loud noises will damage your hearing, which is irreversible. It’s safest to wear a full helmet with a visor which will protect against flying stones and insects in your eyes. It’s easy to be blinded by something hitting your eye when you are doing 100kph. While most people will recover from one concussion, repeated concussions will result in long-term damage. Minor accidents will cause grazing and bruises, but serious accidents without protective equipment can cause serious road rash which can be disfiguring for life and cause ongoing problems with nerve damage. Tarmac will shred fabric like jeans in just a couple of seconds, and the next thing in contact with the road is your skin. Check out this video to see just how bad it can be.